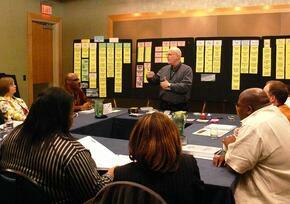 A Unique, Inspiring, and Effective Planning Retreat Like None Other! WHAT is the Father Engagement Experience™? 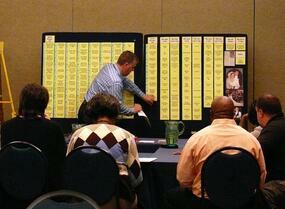 An invigorating, interactive, in-person strategic planning session by NFI staff. 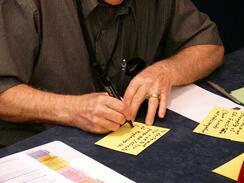 Your group uses NFI's design process to determine the main focus of the session(s) and what you will accomplish. 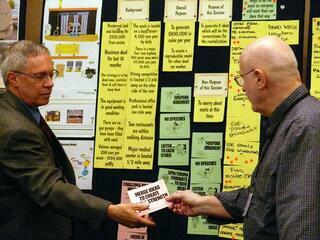 The facilitator uses storyboards, Pure Form Thinking (e.g. not mixing use of the left and right sides of the brain), and multi-voting tactics to help you design strategies. Any organization, agency, or foundation looking to engage fathers more effectively in the broader work they do with families. Ideal for strategic planning sessions, staff retreats, board of directors retreats, staff meetings, or collaborative meetings. The process cuts through clutter and distractions that can bog down decision making. You will also walk away with an actionable plan. Not to mention, people LOVE it! The Father Engagement Experience™ lasts for 2 days. Your group of 10-20 participants will come together at your organization's location or other location of your choice. Investment: $9,999 includes all pre-preparation, planning materials, travel to your location, and session facilitation by 2 NFI staffers. Father Engagement Game Plan™ could look like! Make a Difference for Fathers in Your Community. Contact Erik Vecere, Vice President, Program Support for more information and to schedule your Father Engagement Experience™.